While I was in the states over the summer, I went to a book store to browse around for some interesting looking fantasy books to bring back with me. 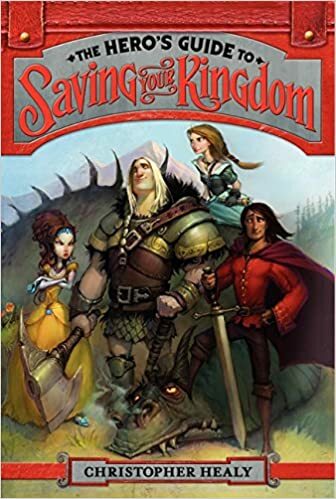 One I chose was The Hero's Guide to Saving Your Kingdom. It promised action, adventure, comedy, and a slightly different version of the fairy tales we all know and love. I've thoroughly enjoyed reading this book and look forward to continuing the adventure with the characters in their next two books. 1) Expect the unexpected. We have four Princes Charming and the four princesses that go with those stories: Cinderella, Rapunzel, Snow White, and Sleeping Beauty. No one is truly who you imagine from the stories/Disney versions. Which gives a fresh slant. The one thing I didn't like about these characters was Sleeping Beauty's portrayal. She's one of my favorites, but here she is a spoiled BRAT. However, having read book one, I'm of the opinion that she may go through a personality change as the series continues. 2) Only one of the four princes is an actual hero. Rapunzel ended up saving her "hero" after he got tossed out of the tower by the witch. Cinderella's "hero" never even left the castle to find her, just sent his servants. Snow White's "hero" had gotten lost in the woods when he came upon the dwarves who insisted he kiss Snow White. Then there's Sleeping Beauty's hero. He did battle the witch and save the day, only to discover Sleeping Beauty wasn't the charming princess he thought she'd be. Lastly, being an incurable romantic, I'm curious to see how the romance plays out among the princes and princesses. 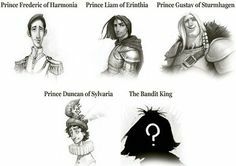 It's possible that all the princesses get a Prince Charming, but which one? Sounds like an interesting take! Sounds cute! I'll add it to my pile. That sounds awesome! I literaly lol'd reading #2. So adding this to my TBR. Thanks for sharing, Julie!